From where the market closed the session on Thursday, it now appears weakness below 7093 risks some near term travel down to an initial 7048 points. In itself, this isn’t terribly alarming but we’ll raise an eyebrow should 7048 break. There is a very real risk of continued travel down to 6925 points in such a scenario. The tightest stop position appears to be 7151 points. As the chart highlights, even reversal to 6925 isn’t such a grim scenario but we do remain with one really big concern. 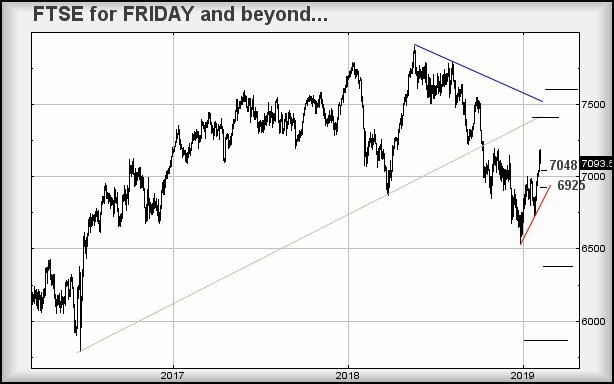 The FTSE is still trading in a region where some negative news can drive it to 6375 in a blink with secondary, if broken, down in the 5800’s. In fact, if this were a share, we’d already assume it intends head to the 5800’s given the presence of the Brexit vote uptrend. Sticking to our “if this were a share” approach, the index now requires better 7235 points before we dare take any rise seriously, such a movement taking the market into a region with an initial 7400 points. Our secondary is at 7600 points. It can be guessed, if only due to our rounding things to a hundred points, we’re not convinced. Near term, it seems movements exceeding 7152 should be worthwhile, allowing some recovery to an initial 7172 points. If exceeded, secondary calculates at 7194, effectively keeping the index paddling on the spot.